I carefully select only those tools that I have used extensively, and that have proven to save me time so I can focus on what matters most in my life. If you are seriously interested in applying technology to your life for the purpose of creating more space in your life, consider adopting some of the tools below. If you feel overwhelmed with the thought, don't be. I have many resources to help guide you step-by-step. If you don't see any resources available now, please email me as I don't want to leave stranded with something that can easily give you hours of your life back a week. Please Note: I am a Mac user so a number of the tools I will be sharing are for the Mac only. I will make known those applications for your convenience. Sanebox's power algorithm will find out which emails are important to you and which emails can wait for later, sending the less urgent emails to a separate folder to be viewed at your convenience. Now your inbox will only contain those emails that truly need your attention in timely fashion. Sanebox also offers the ability to "snooze" emails for later. Just send those emails you are not ready to respond to to a predefined reminder folder, and sanebox will hide that email to the time you suggested, bringing the email back into your inbox as if it is a new message. Finally, Sanebox can remind you when emails you have sent have not been responded to, gently suggesting that you may want to followup. 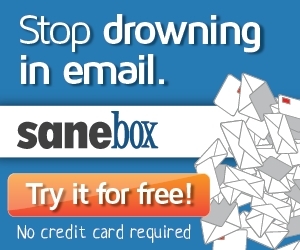 These are just a few of the many powerful features I have come to rely on with Sanebox to keep my email communication sane and my life more living in the real. There is no risk so give Sanebox a try by clicking my affiliate link here. Your free trial can begin today with absolutely no credit card required. Using the same password for multiple accounts. By using the same password for multiple accounts, you allow hackers to have access to most of your private data spread over multiple account by acquiring just one password. 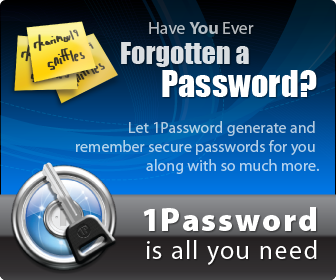 With 1Password, each account has a unique password, significantly reducing the amount of information criminals can obtain. Click my affiliate link here to download the desktop application, and click my affiliate link here to purchase the necessary iOS application (I don't have an android affiliate link yet but the application is available for android as well). I could not live without, and you will wonder how you managed without it once you try it. To download a free trial of the mac application, download my affiliate link here. To purchase the indispensable iOS application, click my affiliate link here. If Omnifocus is my central system for all things actionable, Evernote is my central system for all things informational. With nearly 9,000 notes and counting, Evernote holds everything I could ever need for a future actionable item. Whether it is a receipt I need to make a return/exchange, a movie/book/restaurant/music/wine recommendation, a gift idea for a family or friend, or retrieving some creative stroke of genius I had months ago that I now want to act upon, it is all accessible within a couple keystrokes whether I'm in front of my computer, or on the go with my smartphone. You can download Evernote now here. Fantastical iOS & Fantastical for Mac (Affiliate Links) - I rely on this application regularly on my iPhone to keep me at the right place at the right time. Banktivity iOS & Banktivity for Mac (Affiliate Links) - This is my go to banking software for the Mac and I love it! EveryDollar - This web service has become a budgeting miracle for me and my family. If you are serious about budgeting (which you should be) then you need to check out EveryDollar. While they offer a free version, the paid version offers connectivity to all your accounts. Don't make budgeting harder than it needs to be. Get EveryDollar and splurge the annual service. DayOne App iOS & DayOne App for Mac (Affiliate Links) - This is my go to journal app. I love the ability to tag, divide entries into multiple journals, and search entries by geographical location (i.e. work, family, one journal per child for memories, etc.). If you are into journaling (which you should be for your own well being) this is the app you need to get! iThoughtsX iOS & iThoughtsX for Mac (Affiliate Links) - I have a very formal workflow for writing, and it all begins with mind mapping to get the creative juices going. I exclusively rely on iThoughts for this. Such a powerful mind mapping application for a very reasonable price. Want to be a better writer? Start mind mapping now and start with iThoughts. OmniOutliner iOS & OmniOutliner for Mac (Affiliate Links) - Once I have my brain dump completed in iThoughts, I immediately export it to OmniOutliner for development in outline form.